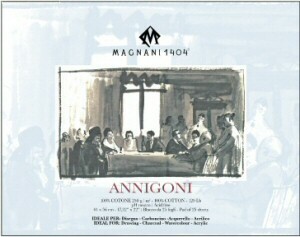 Annigoni is a unique paper being specifically created by the Magnani mill in the 1950s for the Italian painter Pietro Annigoni who is best known for his painting of Queen Elizabeth II in 1956. Pietro Annigoni particularly used the paper for his portrait work. The paper is still made the same way today on a cylinder mould machine using the receipe perfected by the Magnani papermakers and Maestro Annigoni. 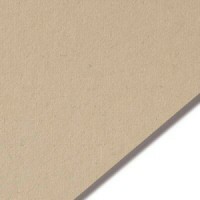 The paper is 250gsm, beige in tone with a wonderful soft smooth surface. It is 100% cotton with the addition of wool fibres and colourants. The paper is lightly sized for a watercolour paper, giving less resistance. 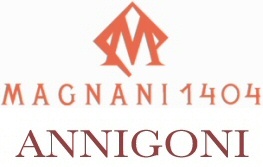 Magnani Annigoni is perfectly suited to watercolour sketching which is enhanced by the warm undertones of the paper. Each pad contains 25 sheets. Full sheets are 50x70cm whilst half sheets are 50x35cm. Measurements may vary slightly. Large sheets are denoted with an L. There is a 5 sheet minimum for the large sheets. You can mix any colours or brands to reach the five sheet minimum.